Zalgiris Kaunas won its first Lithuanian Cup title in three years, topping its arch-rival Lietuvos Rytas Vilnius 82-76 on home floor on Sunday. Rytas stormed out of the gate with 6-16 lead, but Zalgiris made an 11-0 run early in the second, run which included a triple from Arturas Milaknis, to take the lead for good. Another run in the second quarter, this time 12-0, with threes from Will Cherry and Edgaras Ulanovas opened a 15-point advantage, and Zalgiris held 46-32 at halftime. After the break, Rytas came within 57-53 late in the third, but that’s as close as it got. Zalgiris restored control, and with a pair of triples from Siim-Sander Vene and Ulanovas midway through the fourth increased the margin to 72-59, and the hosts cruised to victory. Ulanovas had 16 points and 6 rebounds in victory, Cherry, Vene and Paulius Jankunas each scored 12. 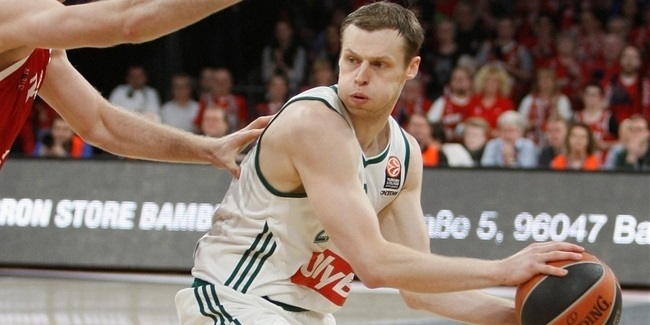 Antanas Kavaliauskas led Rytas with 18 points and 8 boards, while Martynas Gecevicius netted 13. Maccabi Electra Tel Aviv won the Israeli Cup for the 42nd time after defeating Hapoel Jerusalem in its arena 76-94. Behind 27 points from Devin Smith, key to Maccabi’s win was the third quarter and a pair of big runs that turned a slim lead into an 18-point advantage, paving the way to victory. Jerusalem did open the game with an 11-2 lead, but Jeremy Pargo and Sylven Landesberg fueled a 12-2 spurt for Maccabi to go in front. Teams traded blows throughout the first half, and Devin Smith made sure Maccabi takes 42-46 lead into the break. Jerusalem got within 46-48 in the third, but Devin Smith scored a put-back-plus-foul and a triple to extend it to 46-56, before Yogev Ohayon and MarQuez Haynes added threes of their own for 55-73 lead after 30 minutes. Maccabi cruised in the fourth quarter, as Brian Randel scored 14, and Pargo finshed with 13 points. Bracey Wright had 22 for the hosts. Real Madrid defended its Spanish Cup title after downing FC Barcelona 71-77 in Sunday’s final in Gran Canaria. 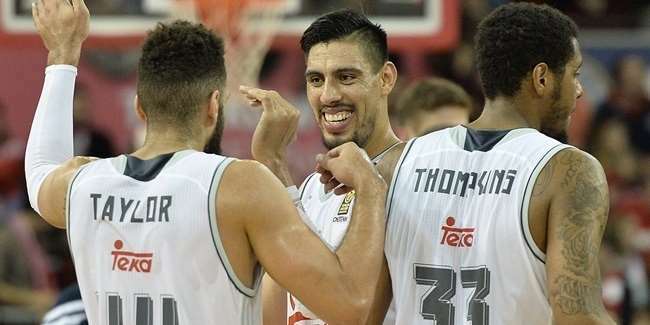 It’s 25th King’s Cup title for Madrid led by Rudy Fernandez who had 16 points, 5 steals and 5 assists while Andres Nocioni, Sergio Rodriguez and Gustavo Ayon scored 10 apiece. Madrid also overcame a monster game from Barcelona’s Ante Tomic who amassed 25 points, 11 rebounds and 3 blocks. Justin Doellman had 11 points and 8 boards, and Tomas Satoransky also scored 11 for Barcelona. Two rivals traded leads in the first half. A pair of triples by Alex Abrines helped Barcelona to 21-18 lead after the first quarter. Nocioni put Madrid back in front 23-27, before Tomic got it going. He scored 13 points in a span of 6 minutes, and put Barcelona in front 42-35. However, Fernandez owned the final 90 seconds of the half, with two steals and a pair of baskets, including a steal and a dunk just before the buzzer for 42-41 halftime score. After the break, Tomic scored 6 more points, and with help from Doellman and Brad Oleson Barcelona opened 52-47 margin. But Fernandez nailed a tough three, Nocioni added one from the right corner for 53-53. Rodriguez followed it with couple of baskets, including a floater after a coast-to-coast drive. Jonas Maciulis added a wide-open three-pointer to the tally, and Ayon beat the buzzer with an acrobatic baseline shot for 57-64 after 30 minutes. Madrid kept the lead in the fourth through Maciulis and Rodriguez, 63-69, but Juan Carlos Navarro banked in an off-balance shot from way downtown, and after Tomic scored from close range, a technical free throw by Navarro tied it at 71-71. Felipe Reyes made two free throws with 63 seconds to go, and after Madrid defended next two possessions, Rodriguez drove the baseline for 71-75 with 7.5 seconds to go, sealing the deal. Dinamo Banco di Sardegna Sassari won its second consecutive Italian Cup after knocking down 14 three-pointers and beating EA7 Emporio Armani Milan 94-101 in the final game in Desio. In a highly entertaining game, Sassari opened big double-digit leads on three occasions, only to see Milan charge back each time. Jerome Dyson and David Logan combined for 18 points in the first quarter, including Dyson’s back-to-back threes that helped open 15-33 lead. Milan scored last 6 points of the first quarter, but in the second it was MarShon Brooks and Joe Ragland who combined to score 18 points, and when Linas Kleiza joined in, Milan cut it to 47-51 at the break. Keliza’s triple made it 52-53 in the third, but Logan, Dyson and Rakim Sanders hit three consecutive shots from downtown, fueling a run that opened 57-72 lead midway through the third. Ragland and Brooks put together another rally for 66-72, but Brian Sacchetti hit a triple to end the third and Kenneth Kadji scored from downtown at the start of the fourth for 66-80. Sassari extended it to 17 points, and had 80-95 with 3 minutes to go, but Brooks triple sparked an 11-2 run within 90 seconds for 91-97. After a timeout, however, Sassari forced a turnover before Sanders and Logan sealed the deal. Dyson finished with 27 points, Logan hit 7 of 13 triples for 25 points, and Sanders netted 20 with 7 rebounds. Ragland scored 21 and Brooks 18 for Milan, while Daniel Hackett had 12 points, 9 rebounds and 6 assists. Anadolu Efes Istanbul lifted the Turkish Cup trophy for the first time in six years after defeating rival Fenerbahce Ulker Istanbul 60-70 in Gaziantep on Sunday. Dario Saric starred with 17 points and 9 rebounds, while Nenad Krstic amassed 13 points plus 12 rebounds for club’s first trophy of any kind since 2010. Efes took its first lead after Stephane Lasme scored on the first possession of the second quarter, and 7 points from Krstic and some help from Thomas Heurtel and Saric, got Efes to 21-30. Nemanja Bjelica, Ricky Hickman and Jan Vesely cut the deficit to 32-37 at halftime, but Saric and Lasme kept Efes in front in the third quarter. Nemanja Bjelica nailed a triple, while Vesely and Melih Mahmutoglu traded baskets with Krstic and Heurtel as Efes took 47-51 into the fourth quarter. Nikos Zisis got Fenerbahce within 51-53, but a basket from Heurtel and a triple from Saric extended the margin to 7 points, before free throws from Saric and Dogus Balbay made it 56-64 with 73 seconds remaining. Hickman buried a triple-plus-free throw to halve the deficit on a single possession, but Fenerbahce did not score again. Even though four different Efes players only split free throws in the final 45 seconds, Efes closed the game out and celebrated a big win. Tournament MVP Heurtel finished with 12 points, and Lasme added 8 in victory. Vesely collected 13 points and 9 rebounds for Fenerbahce, Hickman scored 12, and Nemanja Bjelica had 10 points and 8 rebounds. Leaders Cup has crowned a new champion and it is Strasbourg which held off Le Mans 70-68 in Disneyland Paris on Sunday. Strasbourg dominated second and third quarters behind Antoine Diot and Axel Toupane, before baskets from Paul Lacombe and Bangaly Fofana put it up 52-34 early in the fourth. However, Michal Ignerski, Antoine Eito and C.J. Wallace sparked a 0-10 run for Le Mans, and a triple from Daniel Ewing helped make it 54-50. But a triple from Jeremy Leloup gave Strasbourg some breathing room, and when Charles Kahudi and Petr Cornelie closed Le Mans within a single point, Louis Campbell hit a triple on the ensuing possession for 60-56. Eito answered with a quick basket on the other end, and he later had a chance to win it for Le Mans, but his three-pointer did not find the target and Strasbourg preserved victory. Diot had 11 points in victory, while Campbell and Toupane scored 10 apiece. Ewing and Kahudi each scored 12 for Le Mans, and Eito finished with 10 in defeat. Crvena Zvezda Telekom Belgrade rallied from a double-digit deficit to edge Mega Leks 74-80 and lift Serbian Cup trophy for the third consecutive season. On Sunday in Nis it was a re-match of last year’s final, and Mega that took the lead from the beginning of the game. A triple from Nemanja Krstic followed by 7 points from Rade Zagorac gave Mega 25-16 early in the second quarter. Zvezda got a boost from Maik Zirbes inside, and Marcus Williams hit a triple to get within 29-28, but Nikola Jokic and former Euroleague champ Marko Keselj hit back-to-back threes for Mega, and Jokic added another one from downtown to extend the margin to 42-32. Williams finished the second quarter with a triple, and Zvezda stepped up on defense in the third quarter. On offensive end, Nikola Kalinic hit a triple before Luka Mitrovic strung together 6 points for 45-47. Basket from Kalinic, and a triple from Williams made it 54-59, but Nenad Miljenovic tied the game early in the fourth with a pair of baskets. Stefan Jovic and Miljenovic traded triples and game was tied at 70-70 going into final 5 minutes, Marjanovic scored a layup but Miljenovic countered with a jumper. Kalinic sank a triple, but Miljenovic made a runner for 74-75. However, Kalinic made two foul shots with 39 seconds to go, and Zvezda twice made defensive stands, including Kalinic’s block on Miljenovic to help time to run out, before tournament MVP Mitrovic sealed the win. Mitrovic finished with 21 points and 12 rebounds in 24 minutes on the floor. Kalinic scored 17, and Williams netted 14 on 4-for-5 from three-point range while dishing 8 assists. Marjanovic contributed with 10 points in victory, while Miljenovic led Mega with 21 points. Big man Jokic scored 18 on 4-for-8 from long range. Zielona Gora won its first ever Polish Cup title after 77-71 win over Rosa Radom in the finals in Gdynia. Rosa Radom used an 8-0 run capped by a basket from Danny Gibson late in the second quarter to take 35-43 halftime lead. However, Zielona Gora re-took the lead at the end of the third quarter, in which it allowed only 6 points, while Aaron Cel sparked a 13-1 run, during which Russell Robinson scored 8 points, including two triples for 55-49. Zielona Gora went on to score first 7 points of the fourth quarter, with Lukasz Koszarek hitting a three-pointer to cap a 20-1 run for 62-49. A triple from Przemyslaw Zamojski with 2 minutes to go for 70-61, iced the game. Robinson and Zamojski finished with 18 points each, and Quinton Hosley scored 15 in victory. Mike Taylor had 19 points, and Gibson added 18 for Rosa Radom. The Turkish Cup final will pit Fenerbahce Istanbul against Darussafaka Dogus Istanbul after both teams won their respective semifinals Friday in Bursa.